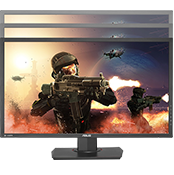 The ASUS MG28UQ gaming display is built for victory in the professional gaming arena. With its 4K UHD panel and 1ms response time, it blurs the line between what’s virtual and what’s real to draw you into truly immersive gaming worlds. It even includes gamer-centric features like ASUS GamePlus and GameVisual technologies to take your gaming experience to a whole new level. 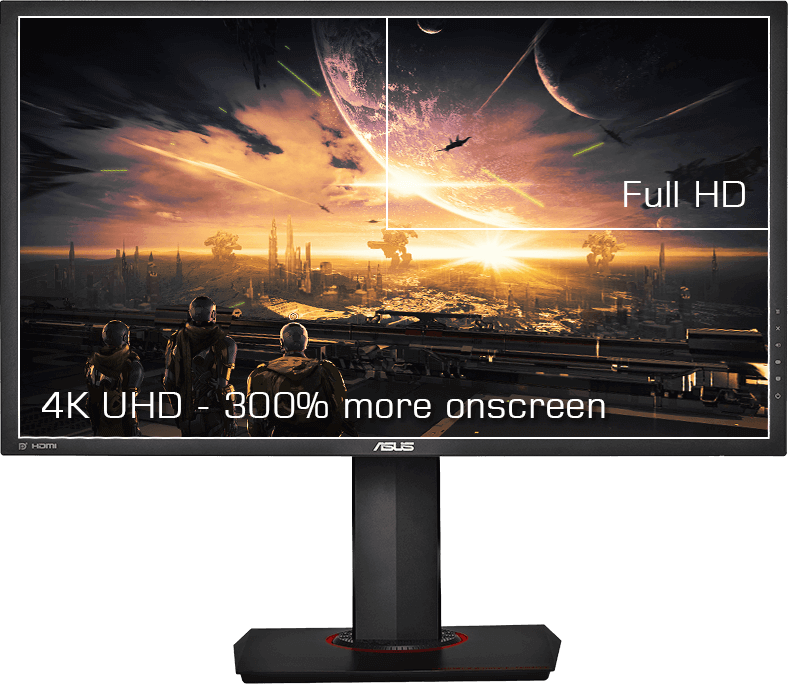 With its 28-inch 4K UHD display, ASUS MG28UQ gives you stunning 3840 x 2160 resolution visuals with a pixel density of 157PPI for incredible photo-realistic visuals and sharp, crisp text. 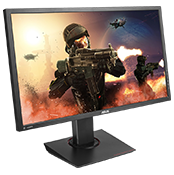 The MG28UQ gives you four times the pixels of similar-sized Full HD 1080p displays so you get more detailed images when playing games or watching movies, as well as more onscreen desktop space for your various work windows. MG28UQ draws you into immersive virtual worlds, with greatly-textured elements and terrain maps that boast impressive levels of detail. Shows less detail and spacing with less room for work bars on the side. See more details and 3 times more onscreen space for working bar on the side. Images are much more crisp and detailed. Even with today’s fastest games, ASUS MG28UQ eliminates smearing and motion blur thanks to a 1ms response time – the fastest in its class. This astonishing visual performance lets you react instinctively to what you see onscreen, so you can take corners like a pro race car driver, or take an enemy out with a headshot as he peeks around cover. 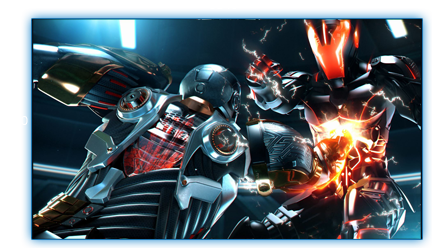 In addition, Adaptive-Sync technology* eliminates screen tearing and choppy frame rates for even more seamlessly smooth gameplay. Whether you’re playing games or streaming videos, ASUS MG28UQ gives you smooth 4K UHD content playback, thanks to a 60Hz refresh rate and native 4K UHD support via DisplayPort 1.2, HDMI(v 2.0). In addition to its array of connectivity options, the MG28UQ even features two USB 3.0 port that lets you quick-charge your mobile devices while gaming;. Command, control, and charge your phone with a double USB 3.0 array, perfect for your keyboard and mouse of choice. ASUS MG28UQ features the ASUS-exclusive GamePlus hotkey to give you in-game enhancements that help you get more out of your game. You can choose between four persistent crosshairs and fine tune their position, ensuring pinpoint accuracy in first-person shooters. Enjoy perfect aim even when the game doesn’t provide its own crosshair or sights. ASUS GameVisual Technology gives you six preset display modes tailored to suit different types of scenarios. This unique feature can be easily accessed through a hotkey or the On Screen Display (OSD) settings menu. 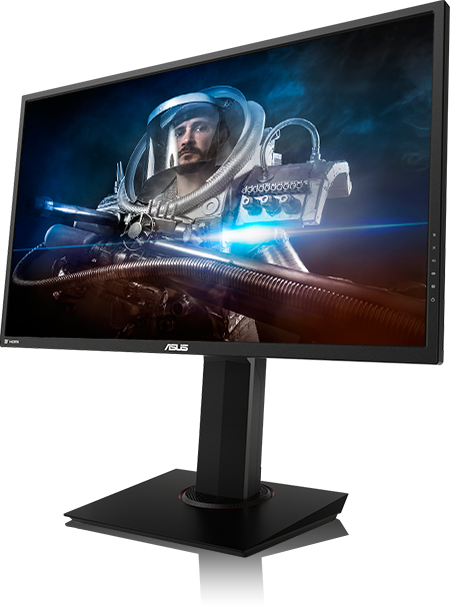 ASUS MG28UQ is specially designed for long marathon gaming sessions. 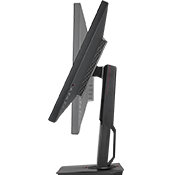 Its ergonomically-designed stand lets you adjust the tilt, swivel, pivot, and height of the monitor so you always find your ideal viewing position. A quick-release latch lets you separate the MG28UQ from its stand so you can mount it on a wall. Our thinnest LCD display yet has a sleek design that’s easy on the eyes. And the crisp, vibrant view from almost any angle comes at an ultra-affordable price. 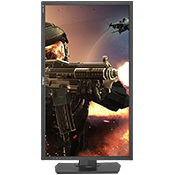 With ultra-wide viewing angles and vivid 1920 x 10802 resolution, this edge-to-edge display delivers an expansive entertainment experience for seamless multiple display setups. Our thinnest LCD display yet1 has a sleek design that’s easy on the eyes. And the crisp, vibrant view from almost any angle comes at an ultra-affordable price. With ultra-wide viewing angles and vivid 1920 x 10802 resolution, this edge-to-edge display delivers an expansive entertainment experience for seamless multiple display setups.